Soldier wounded in action near Ramallah in 2008 is now being billed by MDA for the 761 shekel ambulance ride. 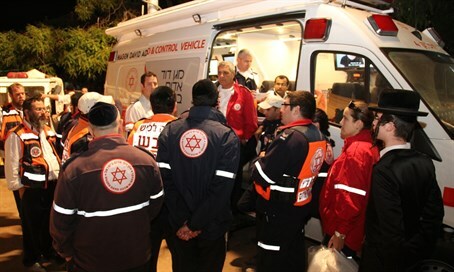 Shay (pseudo name), a resident of central Israel, was surprised to receive a demand for payment of a debt amounting to 761 shekels ($195) by a lawyer representing Magen David Adom (MDA), regarding an ambulance ride in September 2008 during his military service. After Shay was wounded by rocks thrown by Palestinian Arabs during an operation on Highway 443 near Ramallah, he was evacuated for medical treatment to a Jerusalem hospital. The IDF failed to pay for the ambulance evacuation, and thus the debt has risen over the years, unbeknownst by Shay. "Three years ago I received a similar arraignment letter requiring me to pay over 1,000 shekels ($255) for the arrears," said Shay in an interview with Yedioth Ahronoth. "I called the MDA attorney and explained that the incident occurred while I was a soldier. He asked me to prove it, and I explained that I was already discharged, and do not have my Teudat Choger (army ID card) anymore. As an alternative, I sent him my certificate of release and his office informed me that was sufficient and the debt will be paid by the Army." The bureaucratic ordeal did not end there. An investigation by MDA and the IDF accused Shay of not presenting his Teudat Choger to the MDA team that evacuated him. Shay noted that combat fighters do not go on operations with their wallets and ID cards, and in the period after the injury, he understood that the IDF would pay for the ambulance ride. The debt for the ambulance ride was indeed paid three years after by the IDF, but the current demand for payment, accompanied by threats such as foreclosures and taking immediate action against Shay, arrived for the attorneys' fees and accumulated interest. Shay said that he had no other choice but pay the debt, yet the fundamental issue bothers him, and he fears that other veteran soldiers may find themselves in a similar absurd situation. MDA evacuates hundreds of soldiers every year for various reasons, including injuries during operations, injury or fainting during training, and more. Every case is at the expense of the IDF. A request for payment is transferred from the MDA to each unit’s health care personnel, and the soldier is not required to pay anything. Therefore, it is unclear how Shay’s case fell through the cracks. "I served a three year service during which I participated in many combat activities such as Operation Cast Lead. I never imagined to myself that eight years later, I would receive a letter from MDA demanding me to pay for what happened while I was a soldier. It is so absurd, and mostly disappointing," said Shay. Following a request by Yedioth Ahronoth, MDA assured that the debt will be settled directly with the IDF and the demand for Shay to pay will be voided. MDA spokesman Zaki Heller said in response, "The soldier received MDA evacuation service and he had to transfer the payment demand to the IDF following the treatment. The debt was not paid on time, and after collection actions were taken against the soldier, he once againt turned to the IDF to settle the debt." "When a soldier receives medical care through MDA, he must present a photocopy of his Teudat Choger to settle the payment. The IDF paid the cost of the ambulance of the aforementioned soldier, but MDA required the soldier to pay for the interest because he did not present his ID as procedure demanded," said an IDF spokesperson.